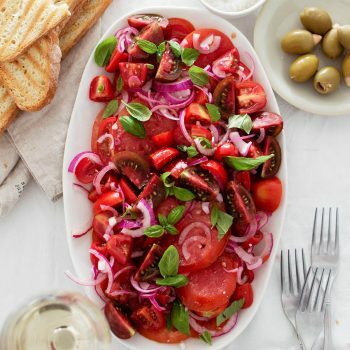 This summer tomato salad with balsamic red onion is so good and versatile you’ll want to put it onto everything! I may complain that it’s too hot out and I hate heatwaves with a passion, but summer isn’t all bad. Definitely not bad. Because of all the produce, which I keep raving about. And today we’re totally bingeing on tomatoes. I wait for this all year long. Juicy, big, meaty heirloom tomatoes. Little plump cherry tomatoes and sweet datterinis. Plum tomatoes and all the other colorful varieties. I mean… I could go on and on, but I know you get the point. Not that it takes much effort, but I really try to eat as many tomatoes as I can during the summer season. The winter tomatoes are a mushy watery tasteless mess most of the time, so I see no point in buying them then. So summer it is. 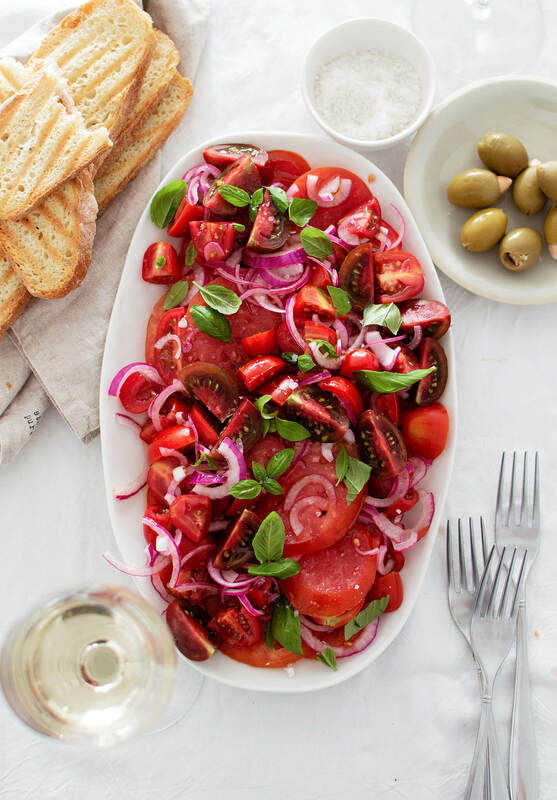 And honestly, out of everything we’ve had for dinner over the past few weeks, this summer tomato salad has been on the menu more than anything else. It’s the simplest thing ever and it’s what makes me happiest. Fresh tomatoes and fresh bread. Although I do usually add a sliced pepper to it as well, because bell peppers are just wonderful right now too. 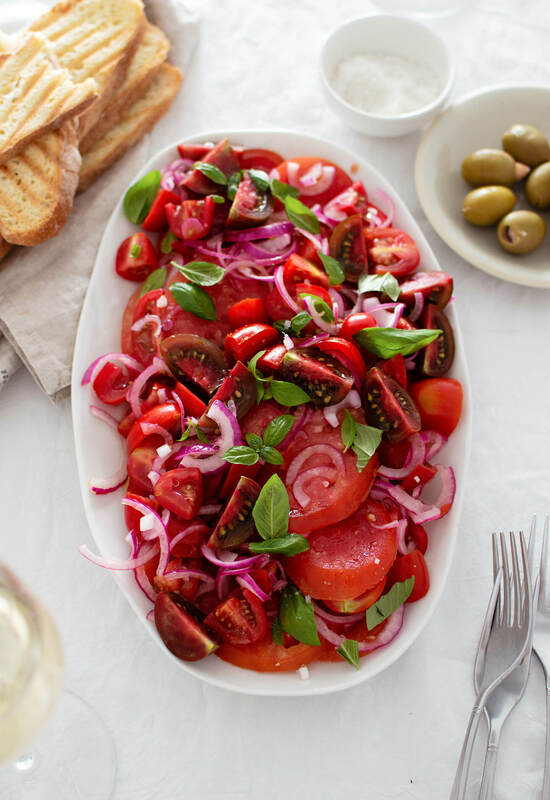 This summer tomato salad with balsamic red onion is very simple. Maybe it’s too simple and it doesn’t look impressive enough, but… who am I kidding? It’s totally impressive and it has one job – showcasing tomatoes. That’s it. A pretty, light salad that goes with everything. 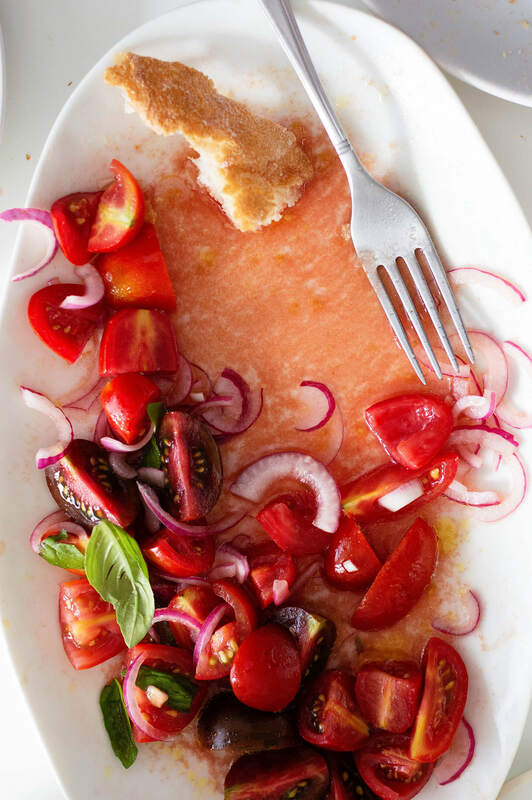 The base is made with the big jewels – sliced heirloom tomatoes. I top these with a thinly sliced red onion, which first takes a bath in some white balsamic vinegar and a selections of small cherry tomatoes. I like to mix the varieties for some color and extra flavor. Lastly, I drizzle the salad with olive oil, add some basil and a generous pinch of fleur de sel. And that’s it! 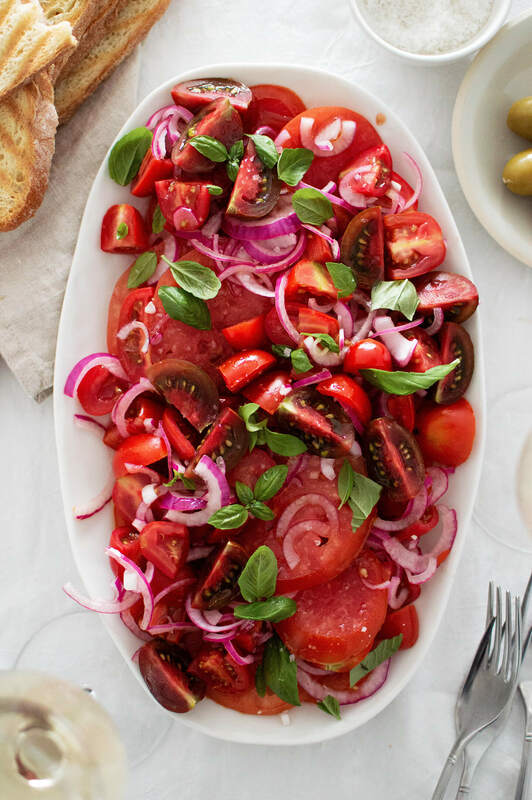 A wonderful summer tomato salad that goes with everything. I love it with some fresh bread and olives, sometimes cheese. But it is superb in a sandwich or burger and alongside anything fried or cheesy. And that tomato vinaigrette that’s left in the bowl? You dip bread in that. It’s mandatory! A light and fresh summer salad, perfect as a side dish or even a topping in your burger. Whisk vinegar and salt in a medium bowl. Add onion and toss to combine. Let stand while you toast the bread. As the bread is toasting, slice the heirloom tomatoes into disks. Also slice cherry tomatoes, either in half or in 4 wedges. Add sliced cherry tomatoes to onion and toss to combine. Take a large serving plate or a shallow bowl and arrange the heirloom tomatoes on the bottom, they can overlap a bit. Top with the onion-tomato mix. Drizzle with olive oil, sprinkle with basil and a generous pinch of fleur de sel. Serve immediately, together with bread and olives. You can also add some cheese and of course wine. Store any leftover salad in the fridge, it’ll still taste pretty good later. You can also put it in a sandwich or burger, because that too is amazing. You can use classic balsamic vinegar instead of white, but know that it’ll make the onions brown-ish. Red wine vinegar is a great choice too. 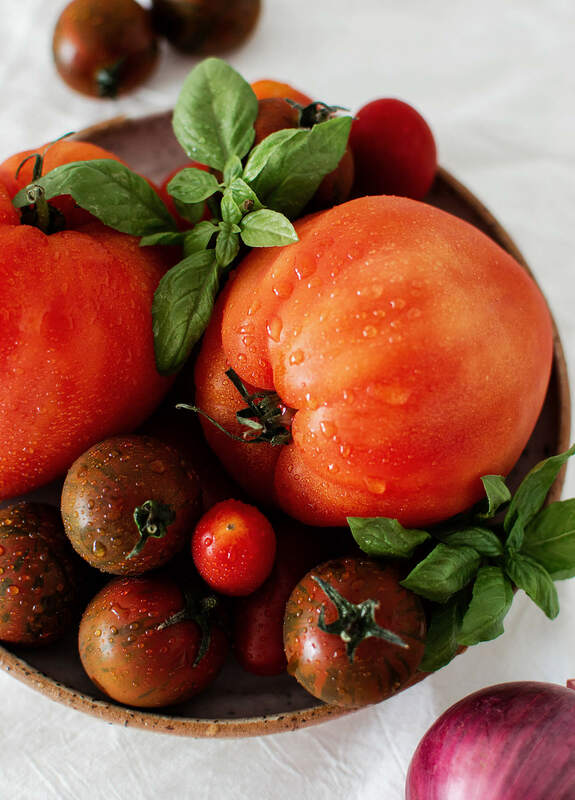 Want to see more drool-worthy tomato recipes? Like this heirloom tomato focaccia? Hop over on Instagram and check out #wesaytomatoes to see what fellow bloggers have come up with to celebrate this wonderful ingredient! Now this is my kind of salad! Easy, fresh and has summer written alllll over it. And I love how you mentioned using it on burgers – great idea!